There are some weekends when it all comes together and I can get my meal prepping done. I love it when this happens because my week just goes a lot smoother when I do that! As I type this, I have two meals already done and in the refrigerator plus my lunch for the week is already completed and ready to go too! I love to eat salads for lunch. I love them even more if I can prep them on Sunday and just grab them in the morning. With the weather getting warmer, I was feeling like a fiesta kind of salad. So I tossed together some chickpeas, black beans, corn, tomatoes, avocado, pepper, and onions. Then I added Newman's Own Lite Lime dressing. And boom! 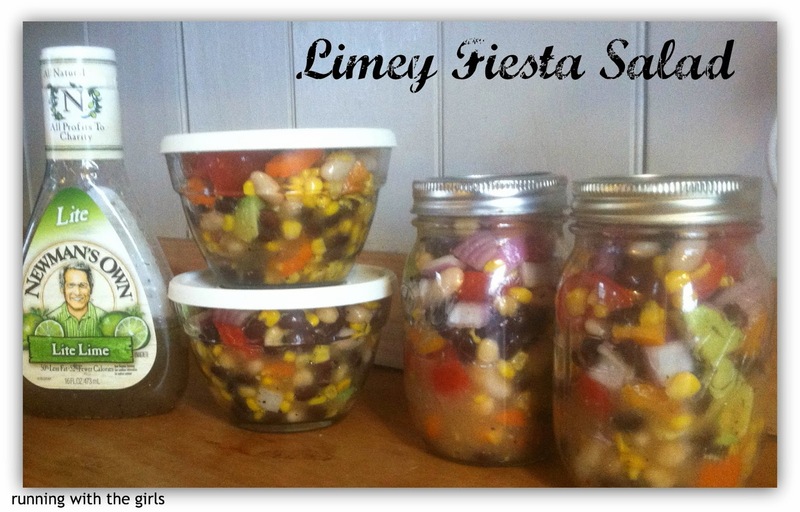 I have a super simple fiesta salad and a new favorite salad dressing. Since I only have four days of school this week, I only need 4 lunches! Kind of cheating - but dinner at Reds, a local pizza place. Reds is hosting a fundraiser for the Class of 2015, donating a percentage of the proceeds toward the class, and since I'm a Junior Class Advisor, I should really go and support my kids. Which means dinner is done! Stuffed Manicotti with meat sauce. Already done and in the refrigerator ready to pop in the oven. Tucker is not a fan of ricotta or cottage cheese and always complains. But for some reason, he is completely okay with greek yogurt. So this time, I shredded some monterey, sharp, and parmesan cheese and mixed it with greek yogurt to stuff into the manicotti. We'll see if he complains about this one! Meatloaf. Already done and ready to reheat. Plus Ward can take some to work with him, since he's working that night. Izzy has dance tonight and isn't out until 5:30. I love having something done already so we can just come home and eat! French toast and eggs. Always super easy and a huge hit here! Tucker has dance tonight and isn't out until 5:30, so again, it's something easy! Leftovers or burgers. Or both! Did you meal prep this week? What are you eating?